The Color TV-Game Block Kuzushi. Color TV-Game (Japanese: カラー テレビゲーム, Hepburn: Karā Terebi-Gēmu) is a series of five home dedicated consoles, created by Nintendo and released in Japan only. Nintendo sold three million units of the first four models: one million units of each of the first two models, Color TV-Game 6 and 15; and half a million units of each of the next two models, Block Breaker and Racing 112. The Color TV-Game series has the highest sales figures of the first generation of video game consoles. The systems can run on C batteries or an AC adapter. 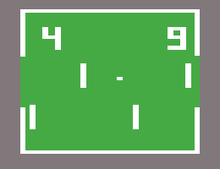 Screenshot of one of the games in Color TV-Game 15 and Color TV-Game 6. The final TV-Game release, Computer TV-Game plays Computer Othello. The series debuted on June 1, 1977 with the Color TV-Game 6 (カラー テレビゲーム6, Karā Terebi-Gēmu Roku). The Color TV-Game 6 was jointly developed with Mitsubishi Electronics. It contains six variations of Light Tennis (or Pong) including Tennis, Hockey and Volleyball; each one can be played in singles or doubles mode. The players control their paddles with dials attached directly to the machine. Additionally, as an alternative to the standard version, a white-colored C battery powered model of the Color TV-Game 6 was introduced. These white colored consoles had a limited run of only a few hundred units. On June 8, 1977, just a week after the TV Game 6, Nintendo released the Color TV-Game 15 (カラーテレビゲーム15, Karā Terebi-Gēmu Jū Go). With the two controllers now on cables (making for much more comfortable play) and 15 slightly different versions of Light Tennis, the CTG 15 yielded sales of more than one million units. Two models of the CTG 15 were released, differing only by a slight color tint change. The Color TV Game 15 included two variations of Hockey, Volleyball and Tennis, and two Ping Pong style games. Each game could be played in singles or doubles mode. The extra game was “penalty shootout” where the object is to shoot the ball past a constantly moving target. Also, the paddle controls were now extended apart from the console, and were wired into it. The console was produced in two shades of orange; the light orange one is much more uncommon. Nintendo sold more than one million Color TV-Game 15 consoles. It appears as an "Assist Trophy" in Super Smash Bros. for Nintendo 3DS and Wii U, and Super Smash Bros. Ultimate. On June 8, 1978, Nintendo released the Color TV-Game Racing 112 (カラーテレビゲームレーシング112, Karā Terebi-Gēmu Rēshingu Hyaku Jū Ni), a bird's-eye-view racing game that implements a steering wheel and gearshift. Alternatively, two smaller controllers can be used for multiplayer. The gameplay features a car from a bird-eye view driving on a track and avoiding other cars on the road. It is possible to play in two player mode as well with controls that attach on the back of the console. This was Shigeru Miyamoto’s first project working for Nintendo, as he was only a junior employee at the time. 160,000 units were sold. The Color TV-Game Block Breaker (カラーテレビゲームブロック崩し, Karā Terebi-Gēmu Burokku Kuzushi) was released on April 23, 1979; the 1-player console runs a ported version of "Block Breaker" (ブロック崩し, Burokku Kuzushi), one of Nintendo's arcade games based on Atari's Breakout. Like the Color TV-Game 6, the in-game paddle is controlled by a dial attached to the system and there are switches to play variations of the same game. The system's external design is one of Shigeru Miyamoto's first video-game projects after having joined Nintendo in 1977. The final console in the series is the Computer TV-Game (コンピューターテレビゲーム, Konpyūtā Terebi-Gēmu). Released in 1980, it was sold and produced in limited quantities. The only game in this console is a port of Nintendo's first video arcade game, Computer Othello. The game can be played head-to-head by two people, or against a computer and was quite sophisticated for the time. Nintendo managed to convert it from an arcade game by simply integrating a complete arcade board which made the machine big and heavy. The power supply weighs more than two kilograms. The console cost ¥48,000 upon release. Comparatively, the Famicom, which came out only 3 years later, cost a third of the price and can play hundreds of games. Color TV-Game 15 on display at the Nintendo New York store. More than two decades after their release, Nintendo featured Color TV-Games in its WarioWare series. WarioWare, Inc.: Mega Microgame$!, released for the Game Boy Advance in 2003, includes a microgame version of Color TV Racing 112, as part of 9-Volt's collection of classic Nintendo games. Color TV-Game 6 also is a microgame as one of 9-Volt and 18-Volt's Nintendo games in WarioWare: Smooth Moves, released for the Wii in 2006. The Color TV-Game 15 appears as an Assist Trophy in 2014's Super Smash Bros. for Nintendo 3DS and Wii U and reappears in the 2018 sequel Super Smash Bros. Ultimate. ^ a b DeMaria, Rusel; Wilson, Johnny L. (2003). High Score! : The Illustrated History of Electronic Games (2 ed.). McGraw-Hill. pp. 363, 378. ISBN 978-0-07-223172-4. ^ a b Sheff, David; Eddy, Andy (1999). Game Over: How Nintendo Zapped an American Industry, Captured Your Dollars, and Enslaved Your Children. GamePress. p. 27. ISBN 978-0-9669617-0-6. Nintendo entered the home market in Japan with the dramatic unveiling of Color TV-Game 6, which played six versions of light tennis. It was followed by a more powerful sequel, Color TV-Game 15. A million units of each were sold. The engineering team also came up with systems that played a more complex game, called "Blockbuster," as well as a racing game. Half a million units of these were sold. ^ "History of Consoles: Nintendo's Color TV Game Consoles (1977-1979) | Gamester 81". gamester81.com. Retrieved 2017-02-05. ^ Fleming, Dan (1996). Powerplay. Manchester University Press ND. p. 180. ISBN 978-0-7190-4717-6. ^ Subramanian, Annapoornima M; Chai, Kah-Hin; Mu, Shifeng (2011). "Capability Reconfiguration of Incumbent Firms: Nintendo in the Video Game Industry". Technovation. 31 (5). ^ "Color TV-Game 15 (Object) - Giant Bomb". Giant Bomb. Retrieved 6 July 2018. ^ "Nintendo Computer TV Game (コンピュータ TV ゲーム, 1980)". blog.beforemario.com. Retrieved 2017-02-05. ^ "Super Smash Bros. Items". Nintendo of America. Retrieved November 7, 2018. Sheff, David; Eddy, Andy (1999). Game Over: How Nintendo Conquered the World. GamePress. pp. 15, 27–28, 32. ISBN 978-0-9669617-0-6. This page is based on the Wikipedia article Color TV-Game; it is used under the Creative Commons Attribution-ShareAlike 3.0 Unported License (CC-BY-SA). You may redistribute it, verbatim or modified, providing that you comply with the terms of the CC-BY-SA.